COFS hosts an extensive library of offshore soils collected for our industry and academic research programs. Our researchers have access to world-class soil characterisation facilities, and our soils library from both Australian and international seabeds enable us to conduct a wide range of new laboratory testing programs whose results can be compared to our exclusive and comprehensive database. Our current library includes carbonate sands and silts from the Brecknock, Calliance and Ichthys fields in the Browse basin, silty sands from Wheatstone on the North-West Shelf and deep-water clays sampled from offshore fields operated by ExxonMobil, BP and Total off West Africa. Access to these soils provides COFS with exclusive opportunities to predict and describe seabed behaviour and mobility. COFS’ database includes results from monotonic and cyclic triaxial and simple shear tests, soil-interface shear box tests, constant normal stiffness (CNS) direct shear tests, Rowe cell and constant rate of strain (CRS) consolidation tests, thermal and electrical conductivity measurements, sensitivity tests, as well as results from many other testing protocols. A team of 55 academics use the soils lab on a regular basis. 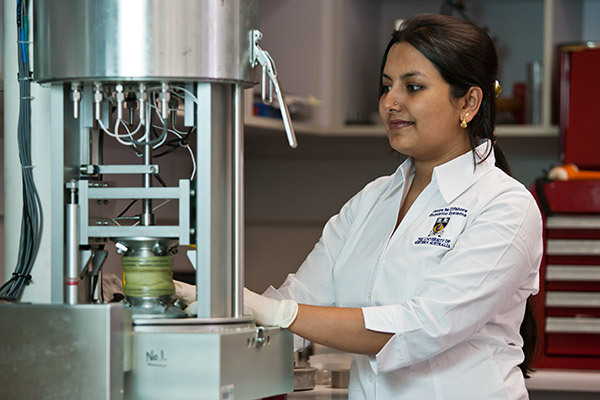 Lab users are overseen by a team of 4 soils lab staff managing over 40 pieces of major geotechnical testing equipment. In 2012, the soils lab saw a financial turnover of $3 million in tests conducted for industry and academic centres around the world. 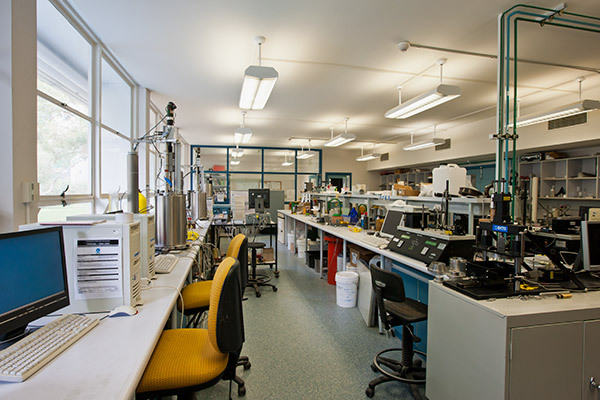 The lab is undergoing major renovation and is currently equipped with a variety of state-of-the art devices required for the rigorous characterisation of the mechanical behaviour of offshore soils and other types of geomaterials relevant to the Oil and Gas, Mining and Transportation industries. Some examples are below. A variety of basic soil characterisation testing equipment is available including a laser-instrumented fall cone apparatus (for soil sensitivity and liquid limit determinations), electrical and thermal conductivity devices, as well as equipment for characterisation of the most commonly required soil index properties including, specific gravity, calcium carbonate content, particle size distribution, Atterberg limits, minimum and maximum densities. 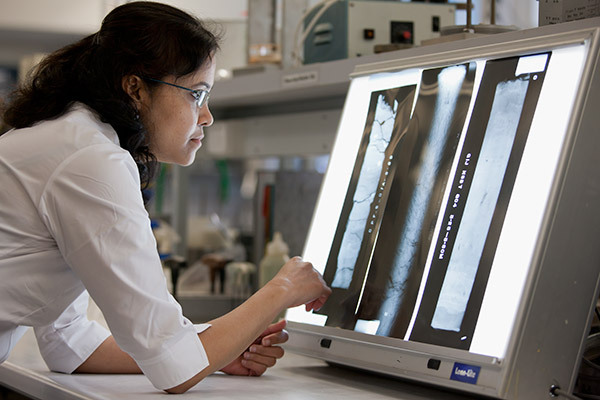 Proper and cost-effective pre-selection of quality samples for further mechanical testing can be conducted in the lab using a modern digital X-ray apparatus. In order to assess the compressibility and consolidation properties of geomaterials, the laboratory hasvarious types of one-dimensional consolidation devices such as conventional (oedometer), constant rate of strain (CRS), and Rowe cell consolidometers. Compressibility and consolidation properties of geomaterials can also be assessed in the triaxial apparatus following isotropic or anisotropic (eg K0 or K) stress paths. For analyses that require more generalised stress-conditions (including inclined consolidation under principal stress rotation and independant control of intermediate principal stress levels), a state-of-the-art hollow cylinder apparatus is also available. The laboratory is equipped with a variety of devices to assess the stiffness of geomaterials over a wide range of strains and loading conditions. Small-strain stiffness can be rigorously evaluated using the lab’s state-of-the-art 3-MPa resonant column apparatus as well as in triaxial devices using bender elements and/or local displacement transducers. Large-strain stiffness is routinely characterised in triaxial, simple shear, direct shear and various other types of testing devices. In addition to stiffness degradation, the resonant column apparatus also allows for an efficient and rigorous characterisation of material damping. A variety of devices is available in the lab that allows determination of the shear strength of geomaterials under various types of boundary conditions. Some of the most requested devices include: soil-interface shear box, CNS direct shear, ring shear, triaxial and simple shear apparatus. Most devices allow testing under monotonic, cyclic and dynamic conditions (up to 10-Hz, in some cases). In addition to conventional drained or undrained conditions, partial drainage assessments can also be conducted with some of our newest equipment. 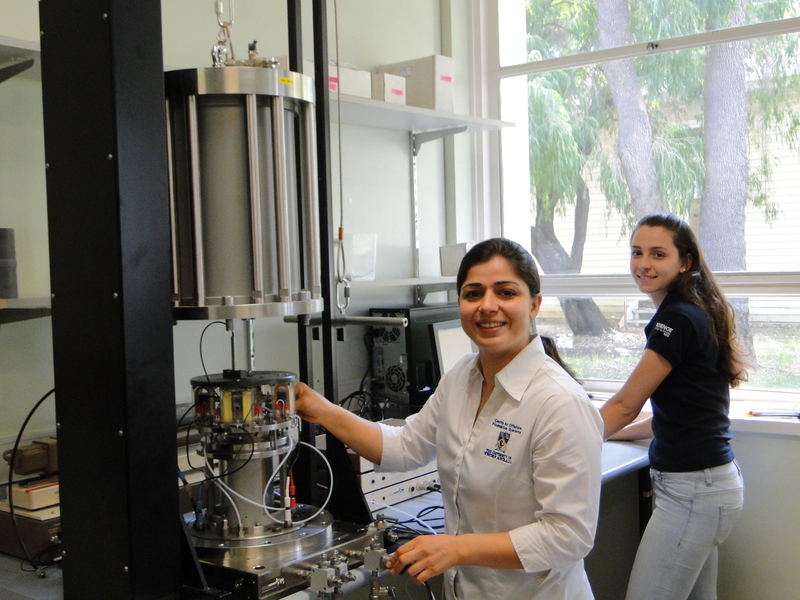 A large portion of our equipment has been built and developed in house, at UWA, including cyclic simple shear, triaxial, direct shear and CNS direct shear devices.Recent developments include the re-design of our cyclic interface shear box testing apparatus (for improved assessment of soil-interface characteristics) and development of a new generation of cyclic simple shear apparatus. 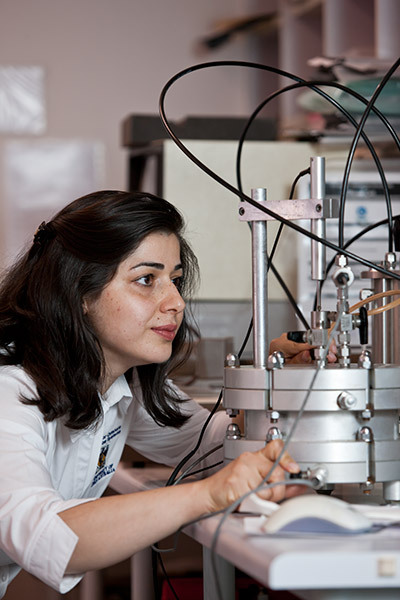 Recent additions include state-of-the art devices such as a 10-Hz-dynamic triaxial apparatus with bender elements, a 3-MPa resonant column apparatus (for stiffness degradation and damping ratio characterisation), and a dynamic hollow cylinder apparatus (for very advanced analyses of principal stress rotation and intermediate principal stress effects as well as rigorous mapping of generalised-stress-strain behaviour of geomaterials). High-quality testing is the main focus of the COFS Geotechnical Testing Laboratory. The lab provides access to one of the best geotechnical testing facilities available in the world to both our industry clients and academic users. Major emphasis is also placed on the continuous training and development of our team (the lab's most valuable resource) to ensure provision of sound technical advice to all lab users. The lab team can also provide guidance on the scientific design of geotechnical experiments required for various types of geotechnical analyses, as well as on the appropriate selection of testing procedures following the highest research standards. One of the main goals of the lab is to make possible that assessments of the mechanical behaviour of geomaterials be conducted under conditions that are representative of the soils state in situ, whenever appropriate. This ranges from being able to test truly undisturbed soil samples directly to allowing soil fabric and anisotropy analyses to be properly carried out, whenever the use of reconstituted samples are required.